$ If you can't do a one-handed second deal, you'll be interested in this alternative handling of the second vanish worked out by my friend Paul Cummins. At the start of the second vanish phase, instead of doing a double turnover, do a triple turnover. That's all there is to it. Later, during the third vanish phase, you can deal the selection off the top instead of second dealing. There is a discrepancy in that the selections are not in the order in which they were placed on the deck. I do not, however, think there is any chance of someone noticing this. Also, you will be vanishing the selections in one. two. three order rather than one, three, two order, which some may consider an advantage. I mentioned earlier that the packet bottom deal at the end is very easy. It's also very safe. You have built-in misdirection as long as you deal the cards face up on the table at a litde distance from the hand holding the packet. The audience is interested in finding out what the cards you're dealing are. To do that, they have to look at the cards on the table, not the cards in your hand. If the dealing action happens at a distance from the table, watching the cards land face up on the table will put the false deal at the periphery of the audience's vision. This provides some insurance if your technique is less than perfect. & Magic gurus often chastise magicians for presenting their tricks exacdy the same way everybody else does. 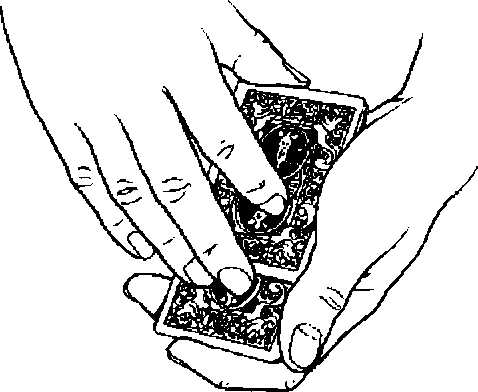 The Cannibal Cards is one of those tricks that everybody presents the same way. This is particularly surprising since the theme offers so much potential for creative variation. I've developed my own personalized presentation that I won't go into since my point here is precisely to discourage imitation. Just to get you thinking, however, here are a few possibilities. Instead of cannibals and missionaries, the theme could be Morlocks and Eloi, or the Donner party, or shipwrecked sailors, or The Texas Chainsaw Massacre, or the zombies in The Night of the Living Dead, or CHUDs. (For the culturally illiterate, that's Cannibalistic Humanoid Underground Dwellers,) Or how about the Twilight Zone episode To S^ujc Man? Alternatively, the four kings could be said to represent Hannibal Lector, Jeffrey Dahmer, Ed Gein, and Alf Packer. (Just explaining briefly to the audience who those gentlemen were could be quite entertaining in a grue some way.) Now you've got no excuse for using the same patter as everyone else.